In this submitted file photo from 2017, Teresa Parris edits her new publication, the independent Conshy Courier. 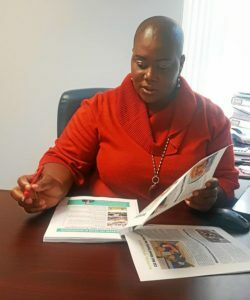 A Nevisian businesswoman who published a monthly “good news” newspaper and website is facing theft and related charges for allegedly financing her publication, in part, with unauthorized funds from the credit account of a Church in Pennsylvania. Police say Teresa Parris, 49, used a credit card belonging to St. Peter’s Lutheran Church, where she worked as an office manager, to pay for the printing of the Conshy Courier over a seven-month period. According to the criminal complaint, an investigation began when church officials contacted police after conducting an audit earlier this year. The audit allegedly revealed 11 unauthorized transactions totaling nearly $24,000 made by Parris between August 2016 and March 2017. Ten of those transactions were payments to the printer and publishing company that published her Conshy Courier Newspaper at the time. The other transaction was allegedly a payment to Parris’ cell phone service provider. On April 3, a detective with the Whitemarsh Police Department interviewed Parris about the audit’s findings and she reportedly admitted to making the unauthorized purchases, according to the affidavit of probable cause. Court records show she was released on her own recognizance after a criminal complaint was filed . In addition to publishing the Conshy Courier, Parris is the proprietor of a mobile notary and won an election to become a Pennsylvania State Constable for Conshohocken Ward 2 in 2016. She is also a member of the Conshohocken Plymouth Whitemarsh Rotary Club and a board member of the Norristown Chamber of Commerce. She was the subject of a feature in The Times Herald in November 2017. Parris and St. Peter’s officials declined to comment for this story.